But a recent statistic made me worry that American apples aren’t safe, anymore. A new report from the Environmental Working Group found that 80% of apples are coated with a pesticide that’s banned in Europe because it could be carcinogenic. European regulators are worried too—so worried about the connection between diphenylamine and nitrosamines, a family of potent cancer-causing chemicals, that they banned the use of DPA on apples and pears in June 2012. That’s why I started a petition to ask the EPA to ban DPA on American apples. Will you sign it? 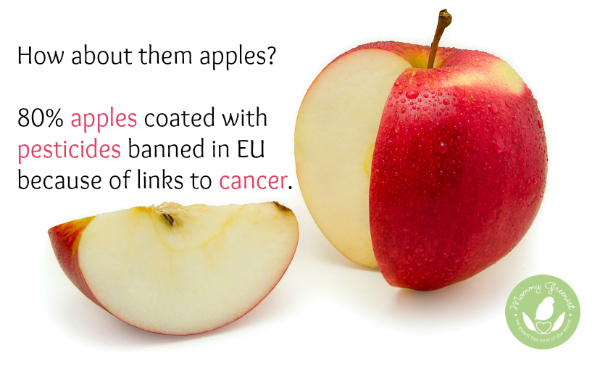 Why should Americans eat apples coated with potentially carcinogenic chemicals, when Europe takes steps to make sure their apples are safe? Stand up for American apples and sign my petition! In the United States, farmers treat conventionally-grown apples with the EU-banned pesticide—commonly known as DPA—after the harvest to prevent blackening or browning of fruit skin during cold storage. Tests of raw apples conducted by the U.S. Department of Agriculture in 2010 found DPA on 80% of apples tested, more often and at greater concentrations than other pesticide residues. They also found it in apple juice and applesauce. The average concentration of DPA on U.S. apples is about .42 parts per million. In March of this year, the EU reduced the allowable level of DPA on imports to .1 part per million, effectively banning the export of American apples to Europe. Considering Americans eat nearly 10 pounds per person of fresh apples every year, you would think that the Environmental Protection Agency would be concerned, right? Apparently, not yet. According to Reuters, under the federal Food Quality Protection Act, the EPA is supposed to conduct a scientific assessment of pesticides every 15 years—but it hasn’t assessed DPA since the late 1990s. And because of concerns about pesticides like DPA, apples have been at the top of the EWG’s Dirty Dozen list in the Shopper’s Guide to Pesticides in Produce since it was first published more than a decade ago. Facts like this make me mad. Why should Americans eat apples coated with potentially carcinogenic chemicals, while Europe takes steps to make sure their apples are safe? 1. Buy USDA Certified Organic apples, since they won’t be treated with DPA or other pesticides. 2. Sign my petition to Gina McCarthy, EPA Administrator, asking her to follow the EU’s lead and ban DPA on apples and pears. 3. Share this information on Facebook, Twitter, Instagram—wherever you can! Let’s get people talking about healthier apples! I know we can do this. If each one of us tells just TWO friends about this petition and shares ONCE on Facebook and Twitter, we’ll reach our goal of 1,000 signatures. The EPA has to listen, right? And soon there will be one less danger to worry about, when it comes to apples. Our fruit will be as wholesomely American as apple pie. Just like the Europeans’. Update 7.31.14: I closed the petition and sent the signatures to the EPA. You can read all about it here! Thank you! Please help spread the word, we need more signatures on this petition to make an impact! Does peeling apples completely remove the toxins or do the chemicals seep into the heart of the apple as well? I never have liked the idea of any pesticides on anything!! They need to find something else to use and stop poisoning us!!! Thanks for telling us about this Rachel! We buy fruit for a healthy diet and it’s loaded with chemicals. Not good. Yes, the pesticide levels on apples are really scary. With that said, you can flush most of them out of your system with just a few days of eating organic. I don’t want people to think they can’t eat apples at all!! I just want to try to help convince our government to do the right thing and err on the side of caution, like the EU. Thanks Linda!